A magnetic Knitlink Arm can be used to convert a USB BrotherLink 1 to a USB BrotherLink 5, a USB BrotherLink 3 to a USB BrotherLink 3 Plus, or a USB E6000 Link1 to a USB E6000 Link 2. They add the Interactive Knitting feature to these links so that they can be used with any machine - including non-electronic ones. An additional Arm is also required when interactively knitting patterns made with the Lace Tool on Brother machines (except the KH940 and KH950i when used with a USB or serial Brotherlink 1) and on Toyota machines. The additional Arm attaches to the lace carriage. The larger Arms attach to any carriage, using fabric fastener. The metallic arm is supplied with USB cables and the black plastic arm with serial cables, but they work in the same way and are interchangeable. 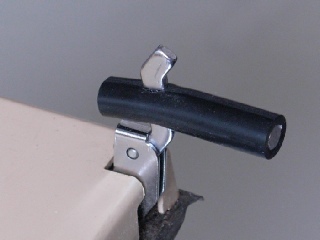 The small Arm attaches to the Brother carriages that have a KnitLeader tripper arm. Brother lace carriages don’t have the tripper and therefore they require one of the larger Arms that attaches with fabric fastener. Large metal KnitLink Arm supplied as part of some USB cable links. The screw fixing makes it easily adjustable to fit any carriage including the Brother or Toyota lace carriage. This is the only Arm currently supplied. (Discontinued) The black Knitlink Arm was supplied as part of some serial Brotherlinks. It is not suitable for the Brother lace carriage. (Discontinued) Small Knitlink Arm previously supplied as part of some serial BrotherLinks. (Discontinued) Large black Arm - the block is larger and gives extra height when mounted on the low Brother lace carriage. This arm may also be supplied with Velcro on the opposite surface for use with other carriages.